The composition is taken from an engraving by Theodor Galle (Antwerp 1571-1633), inscribed on the lower edge 'DESE WTBEELDINGHE WORT DIE BLAVW HVYCK GHENAEMT, MAER DES WERELTS ABVYSEN HAER BETER BETAEMT.' (see K. Ertz, Pieter Brueghel der Jüngere, Lingen, 2000, p. 63, fig. 13). In the latter, however, the descriptions of the proverbs are inscribed on the main composition, rather than included in a table at the bottom, as in the present work. The composition, which follows the same tradition as the famous painting by Pieter Bruegel I (1525-1569) in the Staatliche Museen, Berlin, is often known as 'De Blauwe Huyck [The Blue Cloak]', after the scene - depicted here as no. 62, in the centre foreground - in which a young woman hangs a blue cloak over the shoulders of an elderly man, a metaphor for cuckoldry. The oldest known usage of the phrase is found in an incomplete engraving by Frans Hogenberg of 1558 that bears the text: 'Die blau huicke [is dit meest ghenaemt] maer des werelts [abuisen hem beter betaemt]'. 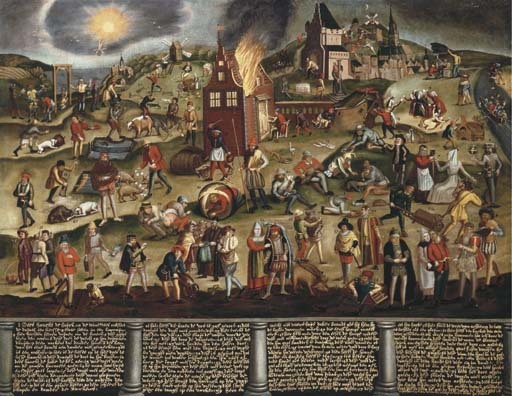 That work would appear to be one of the main progenitors of the tradition that provided both Galle's and Breughel's source of inspiration, as many proverbs and their iconographic interpretations overlap.